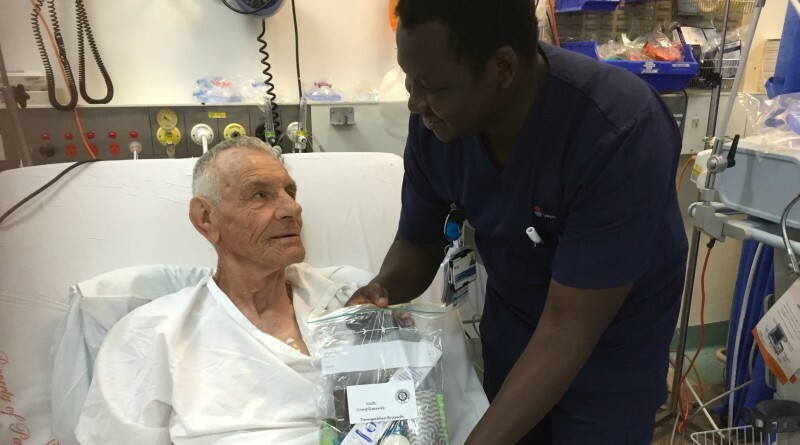 Hans Lehmann receives a care pack from Mount Druitt Hospital emergency department registered nurse Deng Athum. Toongabbie Country Women’s Association (CWA) members have supplied Blacktown and Mount Druitt hospitals emergency departments with more than 100 care packs for patients who unexpectedly are admitted to hospital. The packs contain a toothbrush and toothpaste, comb, soap, tissues, shampoo and a shower cap. Mount Druitt Hospital emergency department nursing unit manager Colleen Mullens said many patients are admitted to hospital from worksites, home or from their doctor’s surgery and may not have these items readily accessible. “The items are individually wrapped and bring a smile to the face of people who are admitted to hospital and are unable to go home and pack these necessities,” Colleen said. Hebersham resident Hans Lehmann was grateful for his care pack as he attended the hospital in a rush and didn’t think about packing the basic especially when everything is a rush. “I was later transferred to Blacktown Hospital and took these personal items with me,” Hans said. Hans has since been discharged from hospital, returning home and getting back to work.